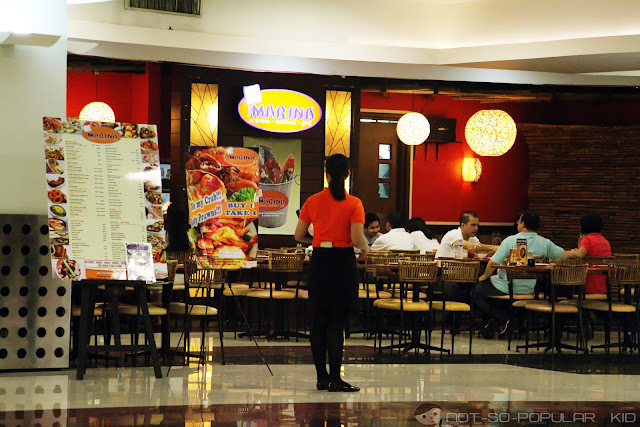 Last Sunday (April 7, 2013), I urged my family to try a restaurant that we don't frequently visit. 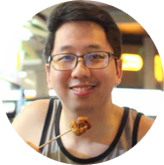 This was for us to be more adventurous in terms of exploring restaurants and tasting various dishes. And gladly, they granted my request. 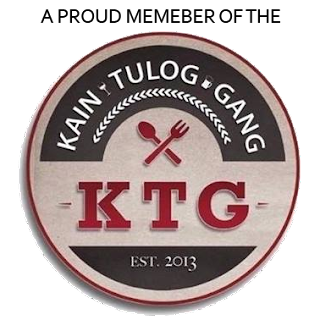 The place isn't that fancy since it somehow exudes an "inuman" ambiance which may be intentional or maybe not. But regardless, it didn't contributed to a better dining experience. The first one to come up was of course the beverages! My younger brother had a Watermelon Shake at P90. And I asked if I could take a sip so I can share the taste with you. 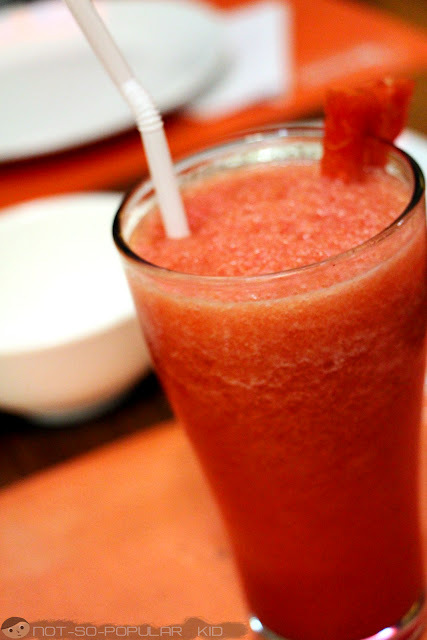 Beat the heat with a Watermelon Shake! The taste of this shake was great, but it was just the way I expected it to be. Well, it really is hard to differentiate basic shakes, right? Nevertheless, for P90, I guess I would think twice next time if I'll order this one up. My mom ordered this Sago't Gulaman at P60 while the rest of us decided just to have water. 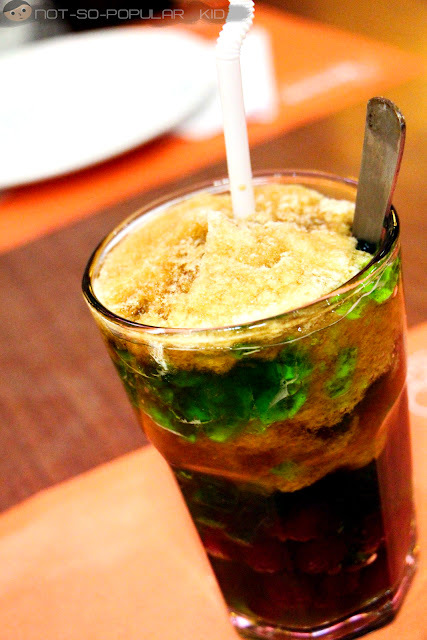 Thirst-quencher Sago't Gulaman, a Filipino Classic! I asked her what she can say about it, and she noted that it was refreshing especially that the ice was finely crushed. But what she didn't like about it was that the gulaman was chewy. Now for the main course dishes, we had first the Beef Kare-Kare at P320. 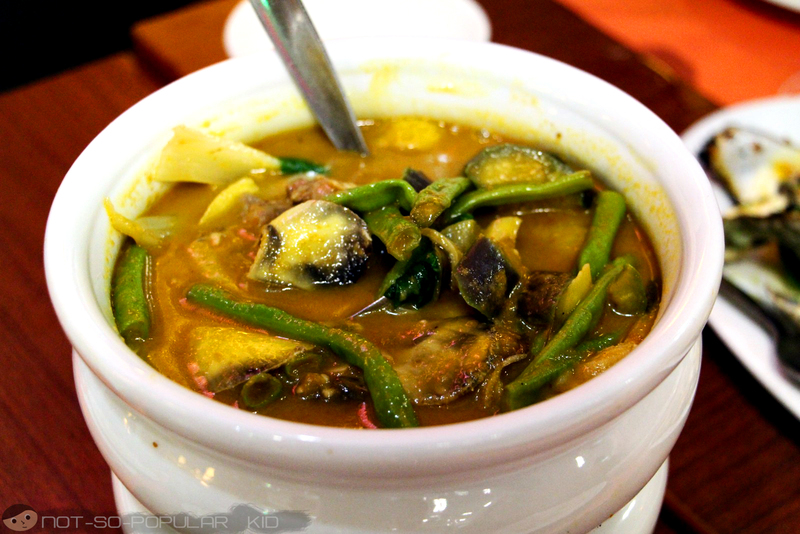 This Kare-Kare, generally a family favorite, also tasted great, but there was nothing so special about it. In fact, I still prefer the Kare-Kare of Barrio Fiesta because that one is creamier with a more distinct flavor. And with a P26 peso-difference (the latter being more expensive), I think I would still pick Barrio Fiesta. 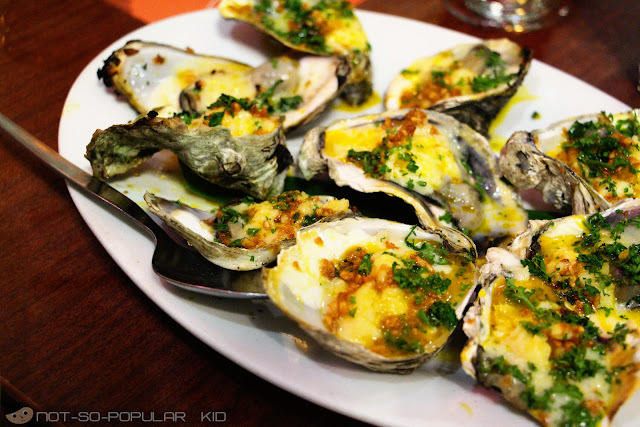 Next one up is the amazing Baked Oyster at P299! Yummy and creamy Baked Oyster! The Baked Oyster was the highlight of the lunch for me. It featured a creamy and cheesy accented taste. And I can infer that the baking technique was great because the oyster's texture was fine! Thumbs-up for this dish! (Note: The taste of the cheese is really distinct, so if you are not a fan of it, then you may not enjoy it much). 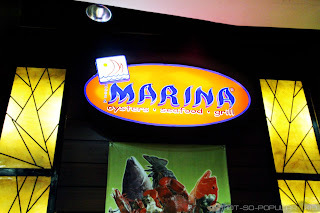 Before we proceed, I just remembered that when we ordered oysters (not the baked ones) in Aida's Manokan Country in Bacolod, a plateful just costed us P40. So, if this is your benchmark, the price of the Baked Oyster will appear to be far more expensive. But, disregarding that fact, I guess it was just priced right. 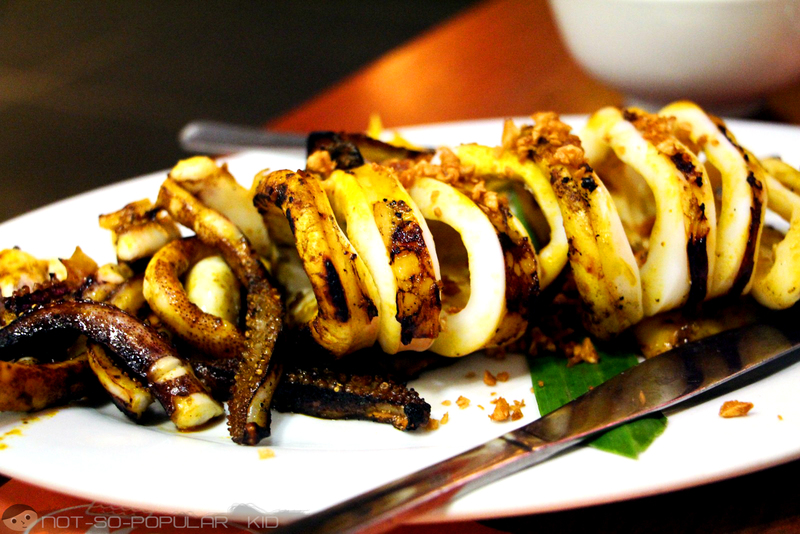 Grilled Squid at P99/ 100 grams with a minimum of 400 grams. Your first bite of this Grilled Squid may indicate that the texture of it was rough, but that was because of the "skin". In fact, as you go along the journey, the texture will eventually smoothen out giving a somehow lasting impression. Yet again, I believe that this wasn't the best grilled squid I tasted so far. 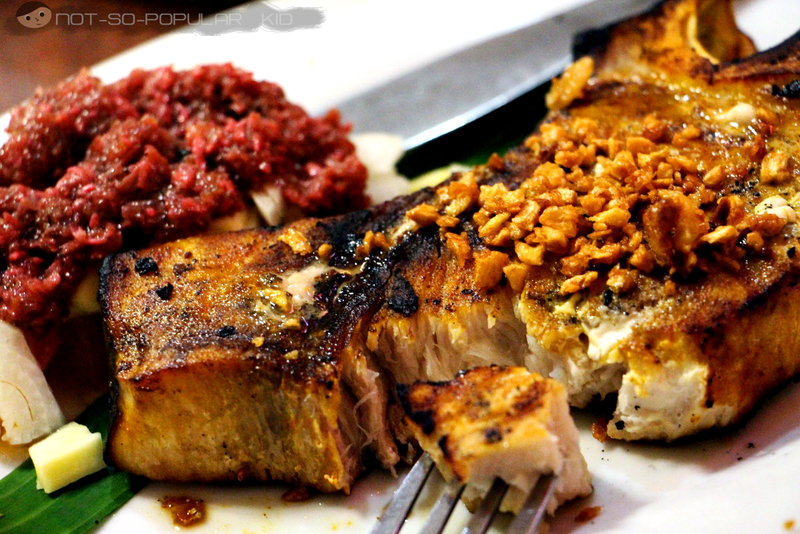 This liempo tasted fine but it wasn't very much tender and delicious. But this was forgivable because Marina specializes on seafood and not with this type of dish. 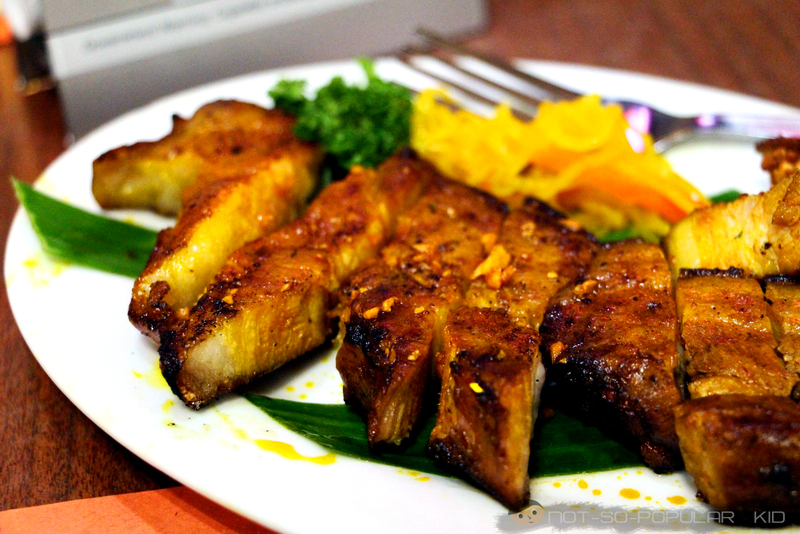 However, what disappointed me was that the liempo contained a big portion of fat which made it not-so-worth the price. Now, for something new: Grilled Blue Marlin Steak at P158/100 grams with a minimum of 300 grams. Initially, just before we started tasting the dishes, I thought that this Grilled Blue Marlin Steak would be the best dish of the day (and this was heightened by the fact that they placed it on top of their menu). However, it was surpassed by the Baked Oyster (Note: This is just a personal preference). Although, I admit that the flavor was great since it was highlighted by the playful taste of butter and garlic. Plus, the "velvety" texture of the fish meat provided a memorable "ticklish" feeling inside my mouth. And that basically sums up all that we had during the lunch. 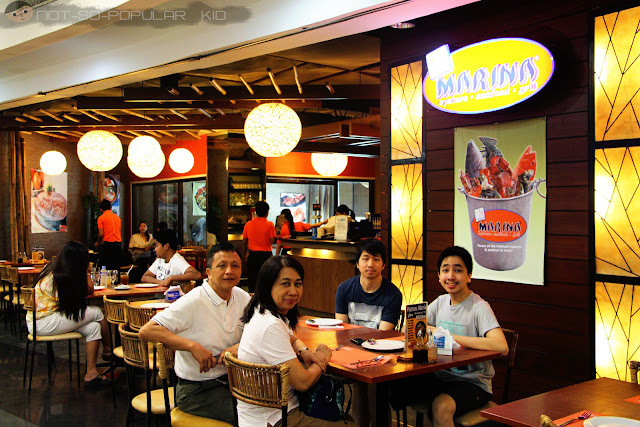 Here's a photo of my family eagerly waiting for their stomach to be filled. 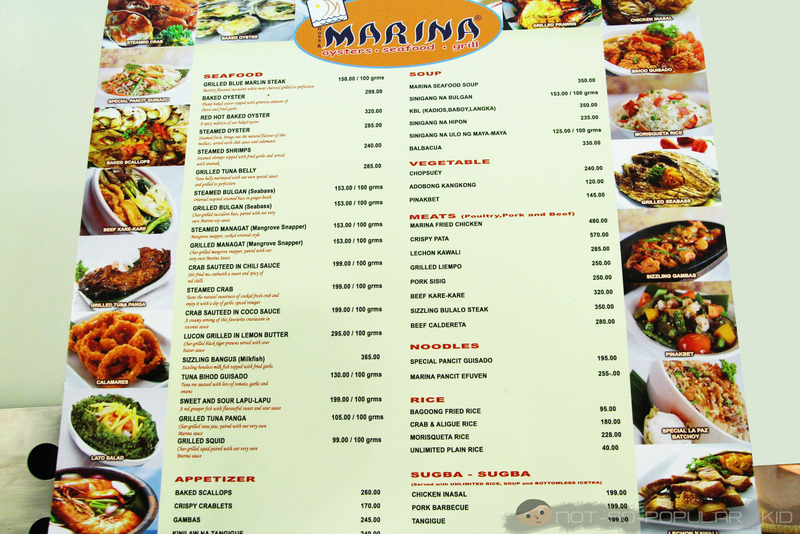 Waiting for the delectable seafood dishes! And the question is, were we satisfied? Well, yes! Because of that, I would recommend that you also try this one out. And since the prices are reasonable, it somehow provides great value for your money. Note, however, that if your purpose is to taste something unique and special, this place may not be suitable for you.